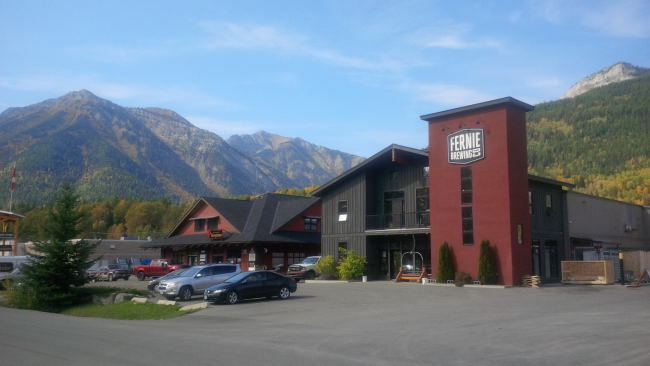 Fernie Brewing is located very close to the BC Alberta border in Fernie BC has been around since 2003. Starting out in the family barn and then moving to the current location things have slowly been building as the thirst for craft beer has exploded. Things have not slowed down at the brewery either as they are currently upgrading their brew system to help increase their output while reducing the amount of work required to make their beer. Located in one of the most beautiful locations of any brewery in BC I was blown away when I arrived at the brewery! The scenery was stunning! When you walk through the doors of the brewery you will find a nice tasting room with lots of taps for tasting and a good amount of merchandise for purchase. Like most breweries they also have bottles and cans for off sales as well as growlers for fills. Fernie Brewing is currently re-branding all of their beer and I was given a look at a good chunk of their brew branding. For the most part I really like the direction they are taking. Normally the guys at Fernie would have given me a tour through the brewery but they were actually installing the new brew house and specifically their grist hopper. Seeing as they were hoisting equipment I was not able to walk into the brewery. I was still able to get a great view of the brew house though as I was taken up to the second floor and was able to get a view of the brewery through a door that led to a second floor mezzanine. From here I was taken outside to see the other side of the brewery where the packaging takes place. There was still a lot of activity here but it was still possible to take a peak. The brewery was still brewing on their old system while the new system was being installed although it was moved to a new location to allow for the installation of the new system. Not only is Fernie Brewing upgrading their brewery to increase beer production but they are also adding a new section to their building to increase storage space. As it is now they are storing grains in containers outside as well as storing whatever they can outside when they can. They were lucky to have a very sunny summer which helped with the upgrades. I didn’t take any photos of the new building as it was only a concrete slab at that point as they are installing a prefabricated building that sits on top of the slab and will go up in only days. If you find yourself in Fernie be it you live there, are on a road trip or are located just across the border in Alberta I recommend a visit to the brewery. They make great beer and you would be missing out if you did not stop bye. This entry was posted in Beer Travel, Brewery and tagged bc, beer, brewery, canada, craft beer, fernie, fernie brewing co, kootenays, mountain, mountain town.